In today's digital world we are using credit and Debit cards for cashed & cashless transactions in every places like; ATM's, Gas Stations, Shopping Malls, Online Payment Gateways and etc. But now time has come, when we need to aware about the proper usage of Credit and Debit Cards to avoid fraudulent activity with your cards. Let me guide you step by step about Credit and Debit Card Fraud and how card scams become an major problem of Internet Fraud. Credit Card is a payment card that a cardholder uses to make payment to any merchant, for this the cardholder agrees to pay the money and other charges to the card issuer. Debit card is a plastic payment card which is also same as credit cards, but in case of Debit card the money get deducted directly from the cardholders bank account. Card Number, Name, Valid From, Valid Thru and CVV No. Generally Credit & Debit cards use a magnetic stripe to read and record all the information related to the card. Under this system, a cardholder at POS machines handover the card to the seller, who swipes the card and returns a printed slip for the cardholder to sign. This system has many security flaws like; the seller person can steal or clone the card or can copy card information without the owner's knowledge. Recently with the invention of CHIP & PIN technology it becomes harder for fraudsters to use a stolen card, because if someone gets the card they might not be able to make fraud transaction without knowing the PIN. But the worry about card fraud is still not over. The fraudulent transaction now shifted to more vulnerable telephone, Internet and mail order transaction known as card-not-present (CNP) transaction. There are various kinds of techniques that are used by fraudsters at different situations. At ATM machine the fraudsters can apply various scam processes like; card skimming, card trapping or even can install hidden cameras to steal your card information. Card skimming involves process like attaching a skimming device into the card reader slot and copy the card information. Where card trapping involves processes like; retaining the card into the machine and recover it later. Beware; If someone trying to help you if your card gets stuck, they might be the fraudsters to reveal your PIN. In case of online transaction fraud someone can reroute you to a fake website. And when you enter your card details it can be stolen. Also, scammers use Spam software like; Keyloggers, which when you install on your computer your keystrokes for UserID, password, PIN's get recorded. Also public wifi is a good hacking opportunity for the scammers to steal your card details. Vishing or Voice phishing is a process used by fraudsters to send fake calls, fraud messages & SMS's, that will tricks you to reveal your card details, Account No. or PIN's. The hackers will speaks very smoothly and will act like they are from the card issuer or Bank. Also mobile Apps that are not from authenticate sources can gain access to your information, ID's, Passwords and personal details. Sometimes the fraudsters can generate a duplicate SIM and block your original one. They will contact your service provider with fake identity proof and can get a new SIM while deactivating your old one. 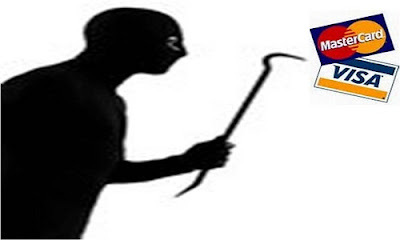 With the help of this process hackers can generate PIN's or OTP's to make online transaction. Card information can be stolen when you submitted your information to any agents at the time of issuing a new card. Even cards can be intercepted from mail before they reach the owner from the card issuer. Beware: Never share your card details including card no., valid dates, CVV, PIN or OTP with anyone on phone,email or any other way. The bank or the issuing authority never ask for your card no., OTP, CVV, PIN or Password.